Home » Hollywood News » Game of Throne: When Jon Snow pretended to be a 'dragon'! Game of Throne: When Jon Snow pretended to be a 'dragon'! It appears that once again, Jon Snow knows nothing and this time, it's about being a dragon. 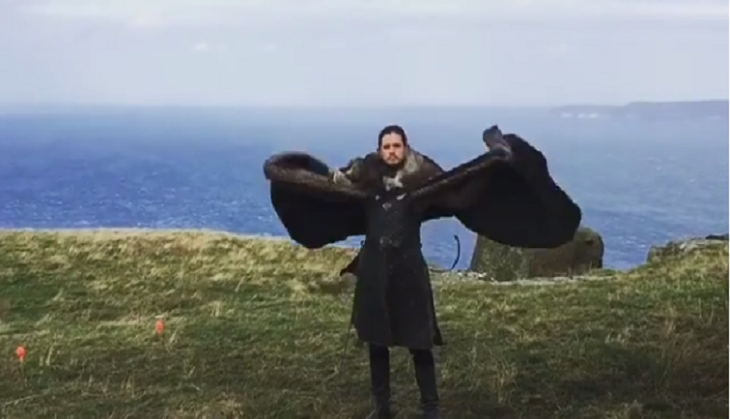 Emilia Clarke, who plays Daenerys Targaryen in 'Game of Thrones,' recently took to her Instagram page to share a behind-the-scenes clip, wherein Jon Snow, played by Kit Harington, tried his best to mirror one of her fire-breathing children. In the funny video captioned as "I mean, JEEEZE, one pet of a dragon and he thinks he's one of them," Harington can be seen spreading his fur-lined coat and flapping it up and down like a pair of wings, while Clarke can be heard giggling in the background. In the last week's episode, fans witnessed one of the most important moments when the King in the North touched Daenerys Targaryen's dragon, Drogon. Talking about it, the 30-year-old actor explained in an HBO clip, "I quite liked that moment with the dragon. I think there was something I wanted to bring to it, which was quite animalistic. Animals go on the smell of something. If you're coming up to a horse, you want it to sniff you before it trusts you." "Hopefully that worked with the dragons. If you show quite a vicious animal fear, it will jump on that, but if you show it bravery, it will respond in a different way," he added. The 'Me Before You' actress noted, "She sees his interaction with her dragons and it's an attractive quality for her." On a related note, it is yet to be officially confirmed, but it's largely assumed that Jon Snow is Prince Rhaegar Targaryen and Lyanna Stark's son, which makes Daenerys his aunt.